“The photo exhibition portrays the death, destruction, grief and hardship of the war contrasting with the images of hope and renewal during the largely-peaceful atmosphere of the recent past”, the FCA states. 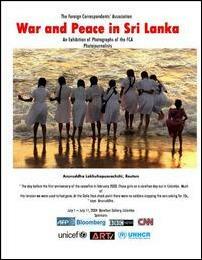 “ The exhibition is an opportunity to stand back and look at how far Sri Lanka has come since the 2002 ceasefire - to take stock of just how important it is to nurture this fragile peace,” says CNN Correspondent Kasra Naji who is the President of the FCA. The five photographers are: Anuruddha Lokuhapuarachchi, Reuters’ photographer; Dominic Sansoni, who works as a freelancer for a range of international magazines including Time; Gemunu Amarasinghe, photographer with AP; Sena Vidanagama staff photographer of Agence France Press; and Syriantha Walpola, the photographer of the Indian newspaper The Hindu who has recently joined the BBC team in Colombo. “The exhibition is also a display of local talent. 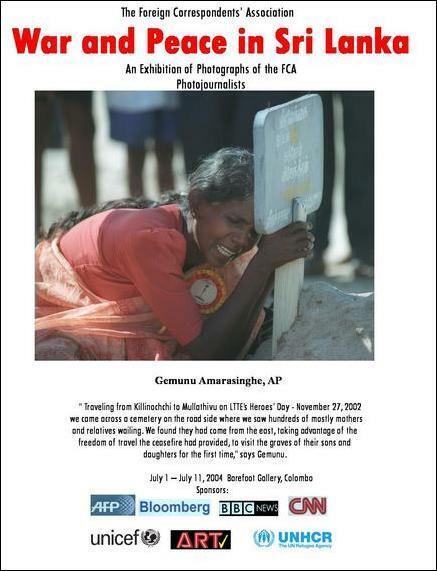 It is an opportunity to give long-overdue recognition to the work, sometimes in very dangerous circumstances, of some of the finest photojournalists around who are all members of the FCA and who happen to be Sri Lankans,” Mr. Naji said. The photos on display have been seen in many newspapers and magazines around the world. 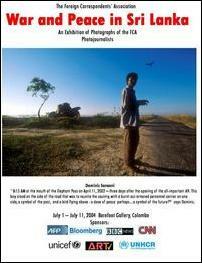 But this is the first time a large collection of them will be seen in Sri Lanka. “I hope the exhibition will also serve to bring home to the younger generation that photojournalism is a worthy profession they may want to pursue,” Mr. Naji said. The exhibition has been sponsored by Agence France Press (AFP), ART TV, the financial newsagency Bloomberg, BBC News, CNN, UNHCR and UNICEF. “Many of the pictures are copyrighted and therefore are not available for sale. However there also many which are not protected by copyright and whose prints can be purchased at the gallery”, the FCA said.